I had never baked a yeast bread with mashed bananas before, so the prospect of this being a first was exciting to me. The texture and aromas of ripe bananas, yeast and vanilla, while kneading, were curious and exhilarating. The aromas from the oven were laced with intoxicating sweetness. 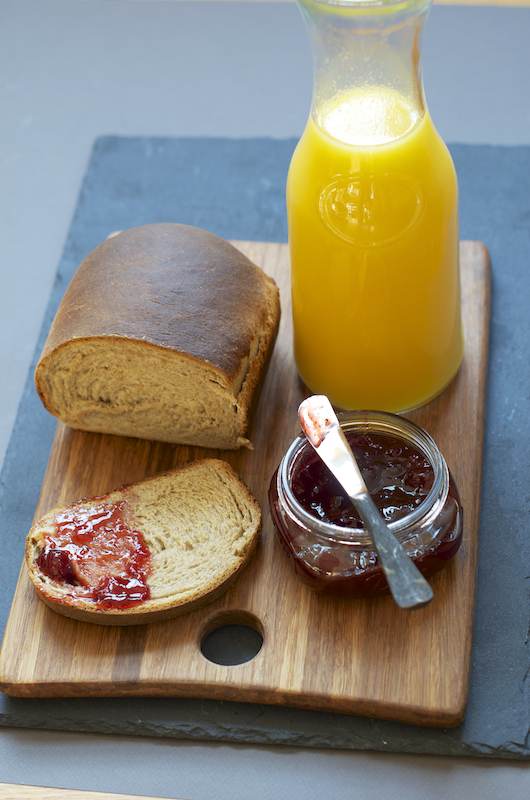 This bread is a welcome addition to the collection of sweet breads, perfect for breakfast, brunch or my occasional breakfast for dinner routine. As you can tell, I was so intoxicated that I couldn't let the loaf completely cool prior to slicing it. In the last few months I have interchangeably been using Red Star Yeast's active dry yeast and its newly launched magical Platinum yeast. I think I couldn't explain the traits of this new Platinum yeast better than explained in this video clip, here, by Gesine Bullock-Prado, a professional baker. 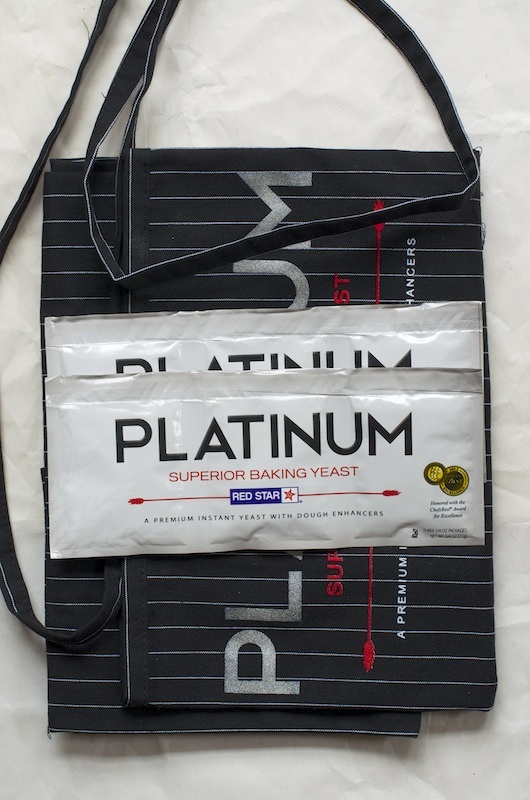 The How to Use Platinum Superior Yeast is also a great guide to baking with Platinum. I know when I use Platinum that my bread will rise in the oven. It seems like Platinum has that extra oomph. 2. 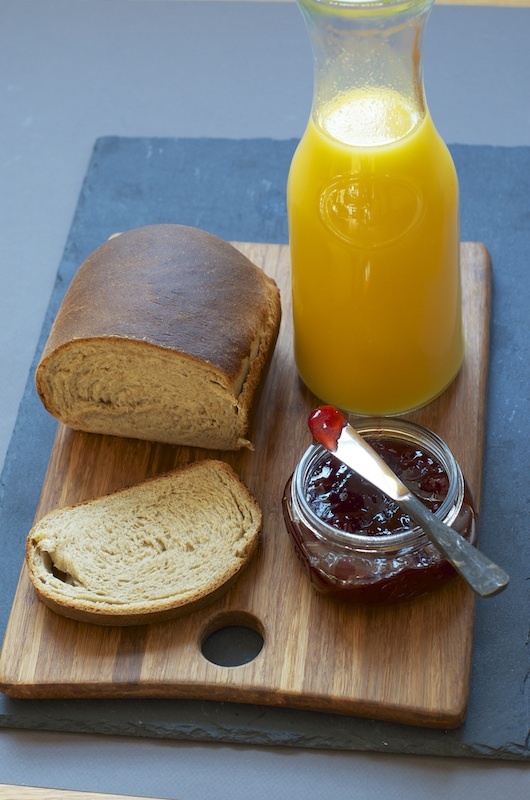 Tweet "Banana Bread and enter to win @RedStarYeast 's Platinum GIVEAWAY @foodwanderings http://tinyurl.com/adewbmy"
3. 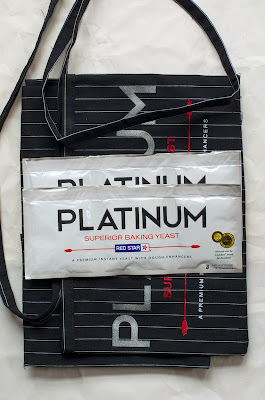 Share on Facebook or Google + as an alternative or in addition to twitter: "Banana Bread and enter to win @RedStarYeast 's Platinum GIVEAWAY @foodwanderings http://tinyurl.com/adewbmy"
4. To increase your chances of winning, leave up to three comments below that you followed Red Star Yeast, tweeted and shared this post on social media. 5. For an additional fourth chance of winning, follow Food Wanderings on Twitter, Facebook, Google + or on Pinterest. Comment below to let me know. Would also love to know your favorite yeast bread or yeast creation. 6. Comments are open until midnight Tue., March 12. Drawing will be done by random org. The lucky winner will be announced on Wed., March 13. 7. Shipping only to US and Canadian addresses. This post is part of my continued professional collaboration series with Red Star Yeast. See below for the entire list in the series. Combine Platinum yeast, 1 cup bread flour and salt into a mixer bowl and mix well. Heat up water and oil to 120F -130F and add to the flour mixture. Mix on a low speed with a dough hook attachment. Add the egg, honey, vanilla and bananas and mix for approximately 3 minutes. Add the whole wheat flour gradually while kneading on low speed. Add enough of the remaining bread flour and knead until the dough is smooth and elastic, for about 5-7 minutes. Pat with a film of oil and set to rise in a large glass, ceramic or porcelain bowl covered with saran wrap, in a warm place for up to two hours. Punch bubbles out of the dough and roll out on a slightly floured surface if necessary to a 14x7 inches rectangle. Starting from the shorter side, roll up the dough tightly. Pinch the edges and tuck under. Place in a greased 9x5 loaf pan with the seams facing down. Cover with a kitchen towel and let rise in a warm place for up to two hours. Bake in a preheated 400F oven for 15 minutes. Reduce heat to 375F and bake for 25-27** minutes longer until browned and loaf sounds hollow when tapped on. Let cool on a rack. *Bananas vary in water content so add a bit more water if dough is a tad dry. **Oven temperatures vary so watch your bread. I baked at 400F for 15 minutes, and it took me only 25 minutes longer once the heat was reduced to 375F. I am so intrigued by this bread. Of course bananas have made their way into my quick breads and muffins hundreds of times, but never a yeast bread. Thanks for the great idea! I´m definitely intrigued by the addition of bananas. Reminds me of breads with mashed potatoes. The texture must be amazing, it looks wonderful Shulie! I´m certainly trying out this recipe. I bake challah every week and I'd love to try this yeast! this bread sounds incredible, what a great idea! I can only imagine how your house smelled while this beauty was baking!!! Wonderful flavors. I'm afraid this bread would never cool in my house, it would be gone in a flash! Fantastic looking & fresh bread!! !I can almost smell the aroma of freshly baked bread here!!!! TY Linda! I just loved the process of baking this loaf! I have never made a banana yeast bread but now I want to. It looks perfect and your description has my tastebuds tingling! BTW I tweeted the giveaway! I follow both @foodwanderings and @RedStarYeast on twitter like forever! I believe I like you both on FB as well! I love the idea of a yeast bread with bananas. Beautiful loaf! What a lovely loaf of bread! I've done a yeasted banana bread before, and it turned out delicious. I'll have to give your recipe a try now. Thank you so much for sharing, and I hope you have a beautiful day! I followed Red Star Yeast, tweeted and shared this post on social media. Nice recipe, I think I'll give it a try later this week. I also followed Food Wanderings, tweeted and shared this post on social media. Good luck to me. Oh, I have been looking all over this city for Red Star Platinum yeast to no avail!!! SO of course, I'm doing all 4 entries!!! I follow RSY on Twitter. what a gorgeous loaf! one more thing from my blog makes it to my growing "must try" folder! I tweeted! Can't wait to try this recipe! I am following Red Star on twitter and facebook! I do not think I have ever baked a yeasty bread with bananas either. So this intrigues me. I can actually imagine and taste the flavors. So want one! I follow Food Wanderings on Twitter (as @AnnaZed), on Facebook, on Google + (as Marguerite Core) and on Pinterest! (and I subscribed too, hi!) I love a classic French baguette (very hard to make). I love banana bread and will have to try this one. I Follow Red Star Yeast on Twitter and Facebook. I Tweeted: "Banana Bread and enter to win @RedStarYeast 's Platinum GIVEAWAY @foodwanderings http://tinyurl.com/adewbmy"
I Shared this on Facebook and Google + : "Banana Bread and enter to win @RedStarYeast 's Platinum GIVEAWAY @foodwanderings http://tinyurl.com/adewbmy"
Stollen is definitely my favorite yeast bread... delicious! This bread looks devine! What a great way for me to use up those extra bananas. I wonder if I can midify it to work in my bread machine? I love the subtleness of bananas in yeast bread. I sometimes make a loaf with banana and cardamom (on the blog) - so good. I will try your loaf next time! I never tried cardamon and bananas before. What a way to combine two of my favorites, in one. רכות ושומן נכון שזה משמע מצויין?! נקודה טובה בקשר למוציא כשהייתי בארץ אפיתי חלות עגולות והאחיין שלי שהוא דתי לא הייה בטוח אם חלות עגולות עשרות להמוציא? This giveaway is now closed. Congrats to Liz That Skinny Chick. :) Please dm or email me your address. Thanks! I have to say, this is one of the best recipes I've come across! I just made it and it's so delicious! I didn't have Red Star Platinum Yeast but it still turned out amazing.. I'm going to make this bread again and again! Thank you! So delighted to hear that alaina. We enjoyed the loaves as well, very much.